The 338 Lapua Magnum is a wonderful, high powered, long range round. Used by militaries and civilians for long distance shooting applications, this round very accurate. 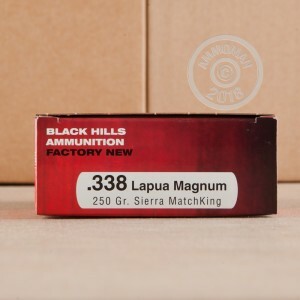 The 338 Lapua Mag was developed in Finland in 1989 and has gained tremendous popularity as a competition shooting and big game hunting cartridge. Black Hills makes some of the most accurate and effective ammunition in America, leading the United States Military to pick them to load their match grade competition rounds. 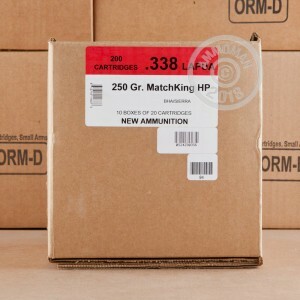 When you are buying long range ammo, accuracy is the most important attribute, and these Black Hills rounds are loaded with 250 grain Hollow Point Boat Tail Sierra MatchKing bullets. These Sierra MatchKing bullets that are some of the best projectiles available and demonstrate consistent and reliable accuracy. 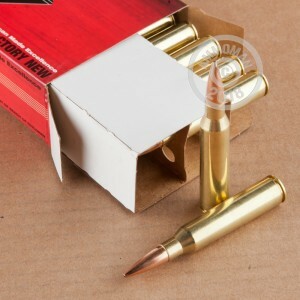 At AmmoMan.com all orders over $99 receive Free Shipping, so order these 338 Lapua Mag rounds today and the shipping is on us!